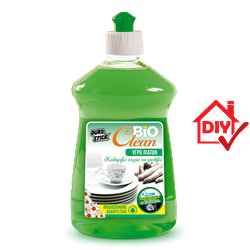 BIOCLEAN dish washing liquid is a detergent free of allergens, ammonia, phosphates and petroleum derivatives. Human and environment friendly, per the european directive EC 648/2004. The specific directive governs the composition of detergents with respect to their biodegradability. It does not irritate hands or eyes and it does not cause any inhalation related problems during and after use. Gentle for the hands but with strong cleaning action. Easily dissolves grease, sauces and all food residues giving sparkling clean cookware, dishes and utensils.